Departed Laguna Woods at 10:15 and on our way. Gear and food filled the car. Buster set up on his two-story perch. Full gas tank and the road beckons. Maneuvering through local traffic to the onramp of the 5 freeway, and we are officially Bishop bound! Buster in his travel spot. As is ‘normal’ in the southern California transit pattern, it was up the 5, over the 241, out the 91, over to the 15, up to 395 and north ……. 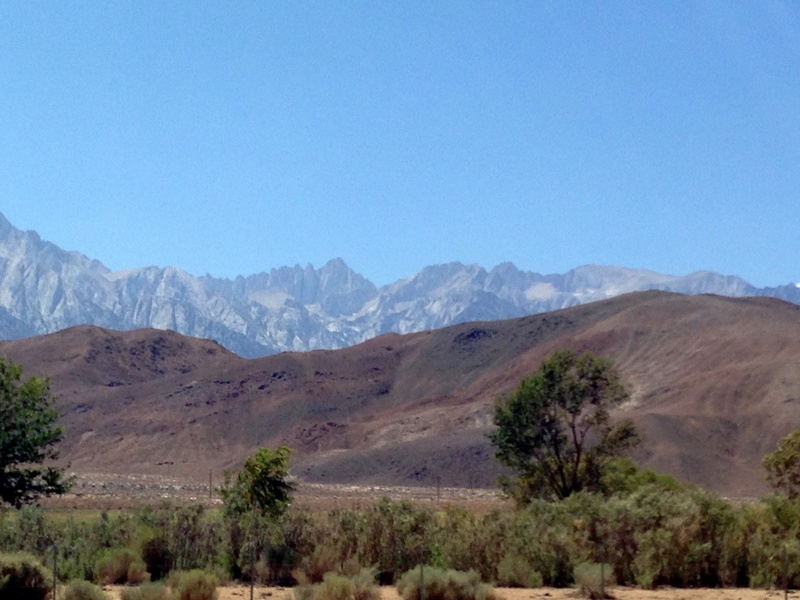 A quick stop at Cook’s Corners for dog and people relief, and then into the gorgeous valley at between the eastern Sierras and the White Mountains. Nothing quite as spectacular as the varied color fields, the spectacular granite faces, and the surprise vistas of Little Lake. Since we are stopping to visit Mom’s college roommate, Sybil, the conversations drift back to those days when USC was her Alma Mater and her whole world was still possible. Mom had gone straight into college – summer sessions, and after two years, when Sybil announced she was getting married, taking some time off seemed logical. I ponder my parents – dad gone and all that can no longer be said – and how my brother, sister and I shared this intriguing path to here. Whitney comes into view. A different flood of memories – of hiking with Steve, Lynn, James, Emma and Mike. Of standing on the top of that majestic peak surrounded by – what felt like the whole world. I’d carried feathers from the sea that last hike, casting them free in slots between the peaks on the final ascent, each one bearing a message to and from someone that I loved. We drive through Lone Pine- always a favorite, and continue up 395 past the Winedumah Inn, where long ago I led the curious on photographic excursions amidst towering boulder fields, scraggly windswept Bristlecone pines, and rough trails through decomposing granite. Around 3pm we pulled into Bishop, checked into the Ramada Inn – a story on poor concierge services to come later – and treated ourselves to a cold bottle of champagne. Dinner – take out from Whisky Creek – to share with Buster and kick back after our first day on the road. Stop #1 achieved. 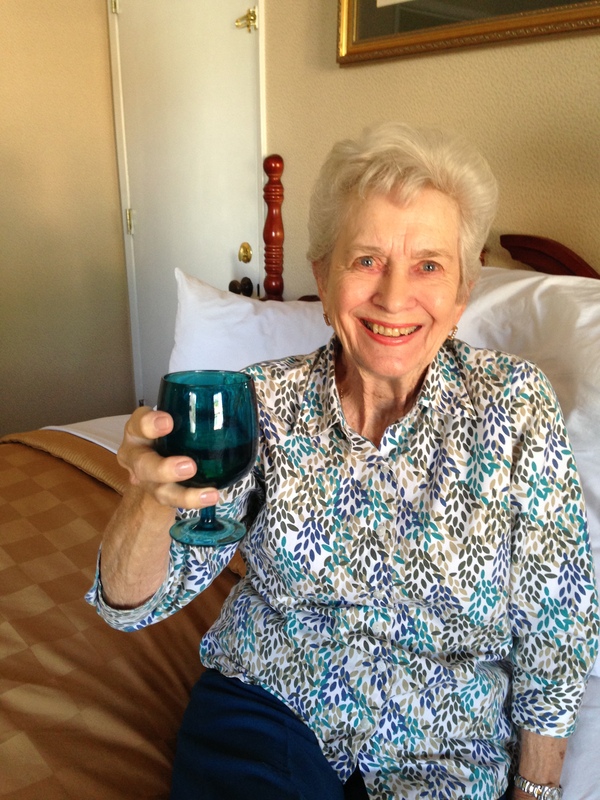 Next, a visit with Sybil and off to Elko, Nevada. Really a great way to end my long day at two weddings and dinner with the familia, pizza in the backyard. gnant my dear sister in law!